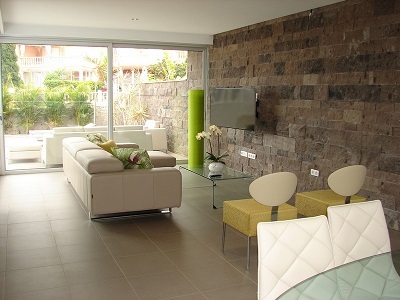 This beautiful four bedroom villa is located in the Del Duque area of Costa Adeje in Tenerife, on the Habitats del Duque development. It has a private pool with 2 terraces, both of which enjoy sea views, and the villa been recently refurbished to a very high standard with high quality Italian furniture. The villa is laid out over 3 levels. The lounge is on the grond level and consists of an L-shaped sofa, glass coffee table, 2 armchairs, as well as satellite TV with English channels. There is also a dining table and 8 chairs. The kitchen is fully equipped to a high specification. Patio doors lead out to a lower terrace which has been comfortably furnished with a 3-seater sofa, armchair and 2 pouffes, as well as two sun loungers. There is also an alfresco dining area and the private pool is also situated on this level. The upper terrace features a special relaxing outside bed and also enjoys brilliant sea views. There are 2 double bedrooms on this level. There are two more bedrooms in the basement level, one double and one twin bedroom. The villa also has a garage.